As the song goes 'what a difference a day makes' and Saturday did just that with wins at good prices for both Ozzie the Oscar and Frodon, combined with Sunday's winner Charbel means that we are now a shade in front for the season. It seemed as though it took forever to break our losing run but in reality, it was just over 2 weeks! Even though we all know well that these things go in cycles and even out in the end, complete emotional detachment is impossible. And we would like to thank you for all the emails of support we've had as it does help enormously. Onto the week's action... Richard Johnson gave Ozzie the Oscar a terrific ride, really positive out in front (which in this ground I think you need to be). He booted him into every fence making the horses mind up... that is until he banked the 4th last where he did really well to survive. Bun Doran snapped at his heels for the last mile and nosed ahead after the last but the Champion Jockey showed all his grit to get up again 100 yds from the line and win a shade comfortably. In contrast, Bryony Frost gave Frodon a completely different ride comprehensively reversing BetVictor form with Baron Alco. 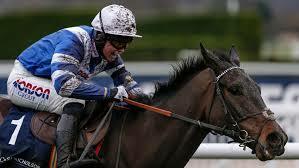 She seems to get a great tune out of Frodon and although he is a bit of a pony he is all heart. She sat quietly allowing him to meet his fences on the right stride and never broke his rhythm. He raced with great zest all the way and he never really looked like being passed. This week we could be in action tomorrow at Newbury or Ludlow, and Friday's Ascot card is looking quite competitive. We will be looking for a repeat of last weekend's success when there is some good racing at Ascot and Haydock. There's some great televised racing over the festive period, so why not treat yourself to our Xmas Cracker... it might just pay for the whole of Christmas!